On the 29th May 2018 the CAA announced that holders of an NPPL Light Aircraft License can continue to fly EASA C of A or EASA Permit aircraft without the need to hold an EASA LAPL until at least the 7th April 2019. ???? 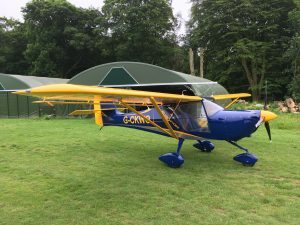 G-CKWO the new Light Sport Aircraft Eurofox arrived on a trailer last night and has been assembled and ground run today. We are now waiting on the LAA to issue a permit to test prior to test flying. Hopefully it’ll be airborne soon ??? Bomber happy to be airborne in the Luscombe again! 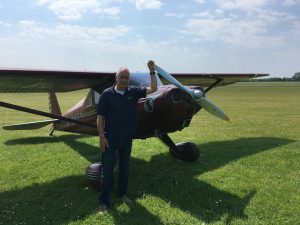 Huge congratulations to Mike who today passed his NPPL SSEA Navigation Skills Test and his General Skills Test in the Cessna 150 ???? Don’t forget our next club fly-out is on Sunday 3rd June departing at approximately 10.30. It will be roughly 3-4 hours flying over the day with a destination decided nearer the time depending on the weather forecast. Both C.O and G.S have a seat available for shareholders wanting to fly one way so please call the office if you want one. H.T is available for shareholders. Club members are of course welcome in their own aircraft. Our next Radiotelephony Course is on Saturday 9th and Sunday 10th June between 10.00 and 16.00 both days, the course covers theory and practical training, please call the office to book ? More success and plenty of flying! 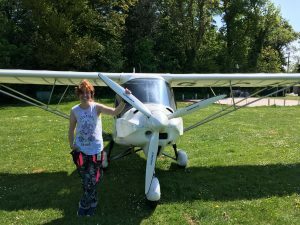 A busy day at Clench with everyone getting lots of flying in, congratulations to Barbara who passed her Communications exam ???? More success as Taz passes his HPL exam ? ?